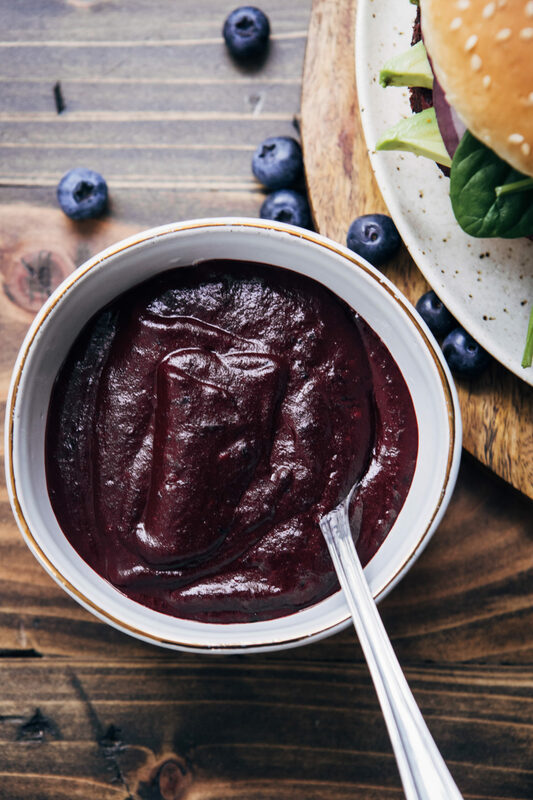 This Vegan Blueberry Ketchup may be the best ketchup you’ve ever tried – it’s tangy, a little spicy, and with a hint of sweetness from the blueberries. This post was created in collaboration with Dr. Praeger’s. All opinions are my own, and I think Dr. Praeger’s rocks!! Sometimes you just need a good burger, amirite? Ever since I started following a plant-based lifestyle, from time to time I get MEGA cravings for veggie burgers. 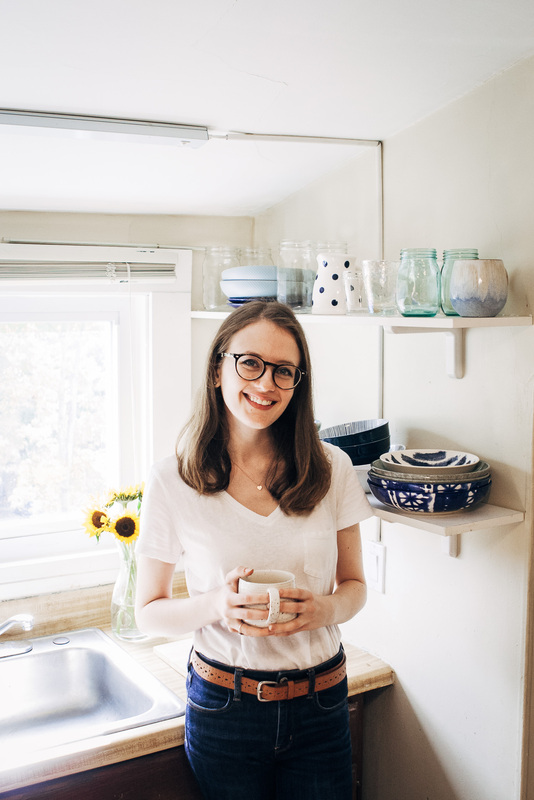 It mostly seems to happen in the spring and summer, because I associate burgers with warm temperatures, barbecuing, and cook-outs! I remember when I first decided to go vegetarian when I was in my teens, there wasn’t a huge availability of veggie burgers on the market. There would usually be one option at the grocery store, and it was never something I liked. 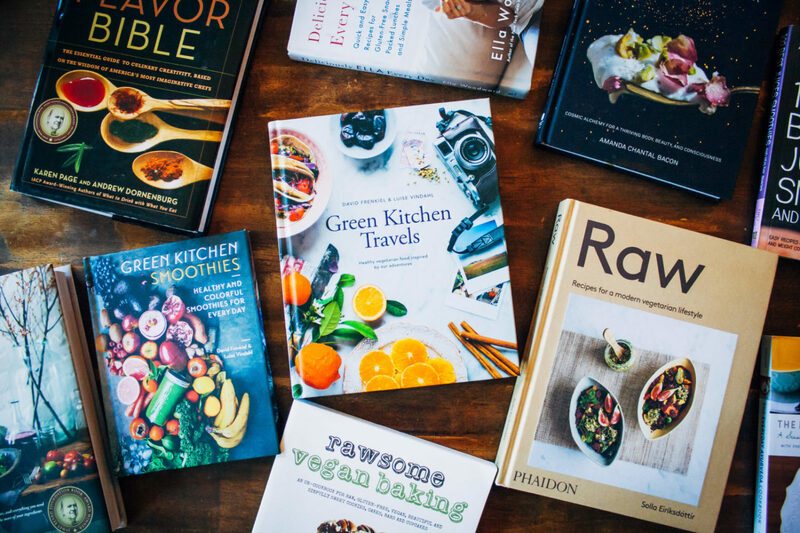 But now, there are tons of options for plant-based folks! One veggie burger that I’ve been LOVING is the Dr. Praeger’s Sweet Heat Beet burger. 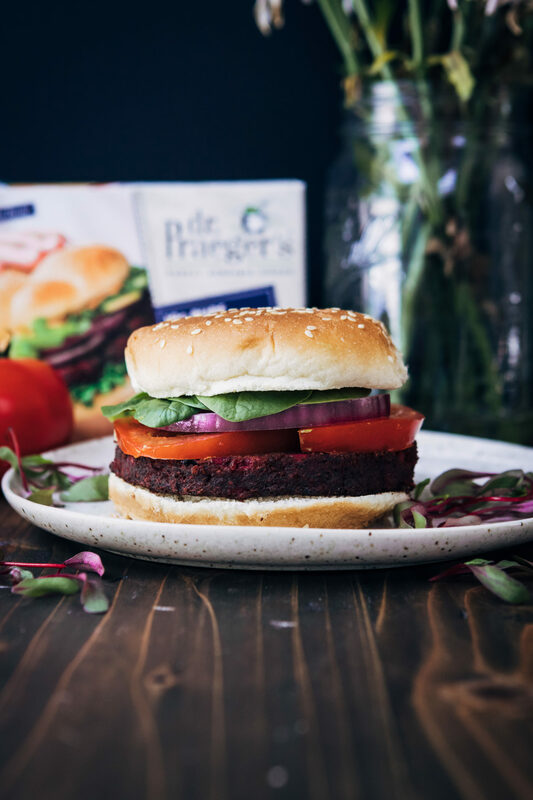 Part of Dr. Praeger’s new Pure Plant Protein line, the Sweet Heat Burger has 19 grams of plant protein per serving and six types on veggies. It has this deliciously earthy beet flavor, but also has a ton of flavors from the onions, peppers, and garlic in its ingredients. This is the veggie burger I would recommend eating with this vegan blueberry ketchup recipe, hands down. The sweet tanginess of the ketchup goes perfectly with the flavors of this burger! If you’ve never made your own ketchup before, you’re in for a real treat. It takes only a few minutes to make this recipe in the saucepan, but the flavors are BIG! You will never want to go back to store-bought ketchup again, I promise! 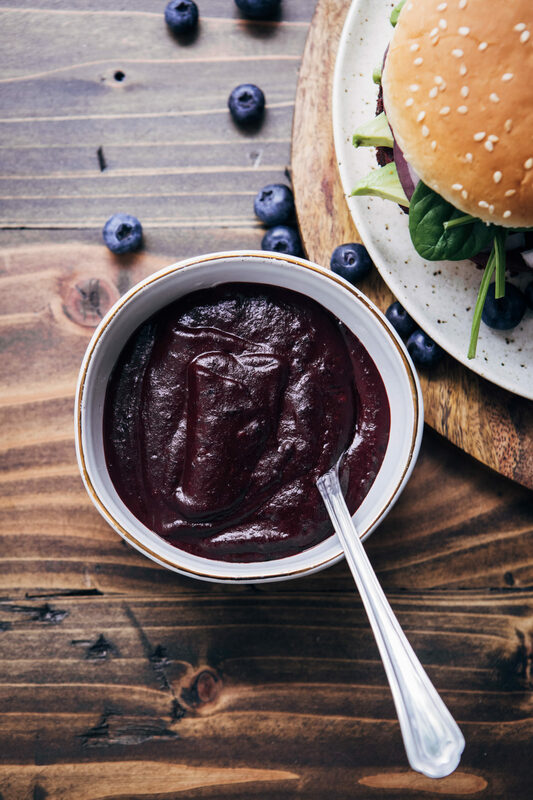 This Vegan Blueberry Ketchup may be the best ketchup you've ever tried - it's tangy, a little spicy, and with a hint of sweetness from the blueberries. In a small saucepot, add in the chopped red onion and a drizzle of a neutral vegetable oil and bring to medium-low heat. Sauté until the onions are soft, about five minutes. After the onions are soft, add in the chopped garlic and sauté until garlic is fragrant, which should take less than a minute. Be careful not to let the garlic burn! Then, add in the blueberries, tomato paste, and water, and simmer on medium heat for about five minutes. Then, add in the apple cider vinegar, paprika, salt, and black pepper, and stir well. Simmer for another 5 minutes. Then, take the ketchup off the heat and let cool. Once the ketchup is cool, add to a blender and blend on high until it's smooth. Serve ketchup with your favorite veggie burger or as a dip for fries! Loove the flavor profile of this mouthwatering sauce, Sarah! I’ve not tried Dr. P burgers, but they are on my list! This looks absolutely delicious! Blueberry ketchup?! That sounds so interesting! I bet it’s super tasty!